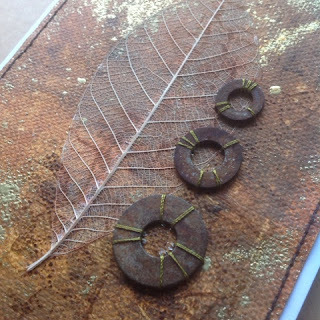 The Paperartsy challenge (abstract art) really got my juices flowing! These cards are very much like the one I posted earlier. I just wasn't sure I'd have time to put them all together. 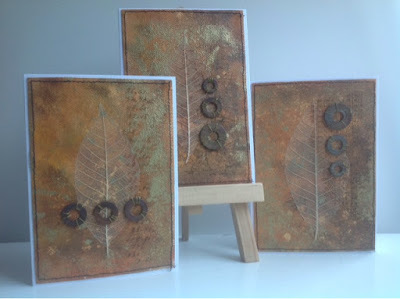 The background is a canvas sheet painted with brown acrylics. 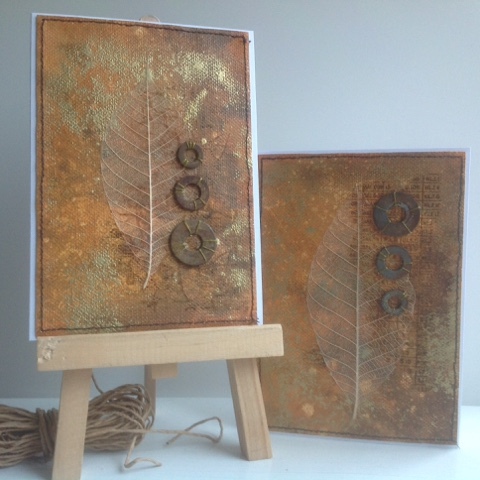 I misted with Colour Bloom, and used the sticky ink spray to emboss with gold embossing powder. The canvas was divided into four pieces, one of which I've saved for another project. I wasn't planning to add the skeleton leaves on all of these, but the effect was so fun, I couldn't resist. Depending on the angle you look at, the leaf is almost invisible or strikingly almost white. The backgroung stamping has been done with brown Stazon. To my surprise it dissolved quite a bit after I added Satin Glaze to adhere the leaves. The glaze has been added to the whole surface, but dissolving happened only under the leaves (the area ended up with the thickest layer of the glaze). This just adds to the rusty look! 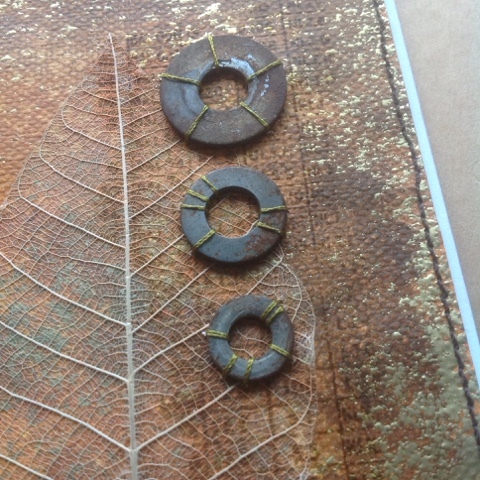 The rusty Spacers have been stiched with a shiny green embroidery thread, after which I adhered the pieces to card blanks. The three cards practically form a triptyche, here they are together. Sorry for the silly blue light, it's weirdly foggy outside!